Linda Lee (Wicken) Porter, 69, long time resident of Bishop, California went to be with Jesus in Heaven on Tuesday December 5, 2017. Linda was born May 8, 1948 to Jack William and Mary Elizabeth Wicken. She is survived by her children Tom and Jolene, her sister Jacqui, nieces and nephews and five grandchildren. Linda loved being with her family, enjoyed the outdoors, fishing and creating beautiful rock jewelry. 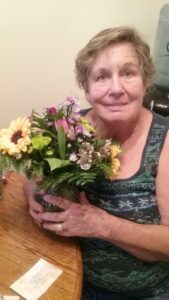 She was a compassionate CNA for over 20 years. Linda also enjoyed her work as a volunteer for the VFW in the Ladies Auxiliary. She was very passionate about her country and veterans. Linda was a child of God and showed His love by putting others first, whether that was listening to people, bringing food to them or doing something for them. She will be greatly missed. The family is holding services for Linda Saturday December 16, 2017 at 1pm, East Line St. Cemetery Bishop, CA. In lieu of flowers and cards please donate to the Lung Cancer Center of your choice.